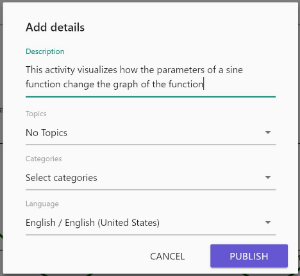 If you want to publish a resource in order to share it with the GeoGebra community you can use the new Publish dialog. 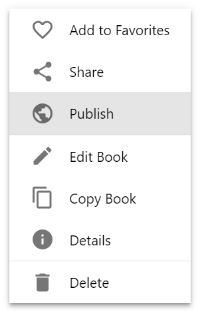 To publish your resource, click on the resource's menu and select Publish. Before your resource will be published, we ask you to add some details. If you add a description, categories, topics and the correct language it will be easier for others to find your great resource. You can shortly describe your resource here. The description will be visible in the details of an Activity or above the table of contents in a Book. 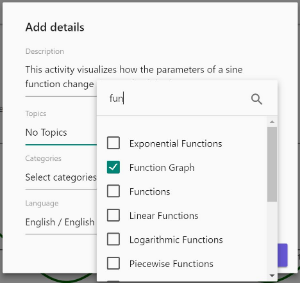 Select one or more topics that match your resource from the Topics drop-down. You can use the search field to find specific tags faster. Click outside the popup to close it. In the next step you can choose one of the given categories to classify your resource. Pick at least one category. Click outside the popup to close it. Last but not least you can change the language if it isn’t correct. By selecting the Publish button you save the added details and finally publish your resource . 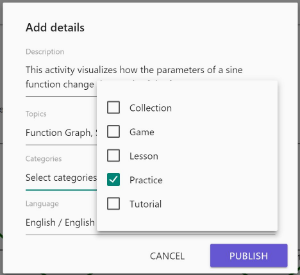 Now all people in the GeoGebra community can find and use your great resource. 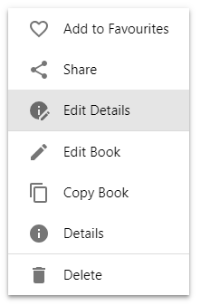 If you want to change the details of your public resource, open the resource menu again and select Edit Details. Now you can change description, topics, categories or language by simply selecting others or deselecting the old ones. If you want to change the visibility you can do this in the editor of your GeoGebra book resp. activity.